Although allogeneic stem cell transplantation is a potentially curative treatment option for AML, it is also associated with the risk of several serious side effects. One major complication is a disease called graft-versus-host disease (GvHD). GVHD occurs following stem cell transplantation as the donor stem cells grow and repopulate the body’s immune system. A specific group of the donor’s white blood cells in the transplant, called T cells, identify the patient’s body as foreign and attack it. Normally, these T cells are performing their job correctly by protecting the body from abnormal cells, such as virus-infected or tumor cells. However, in the course of GVHD the transplanted T cells also react against the patient’s tissue, resulting in tissue and organ damage. 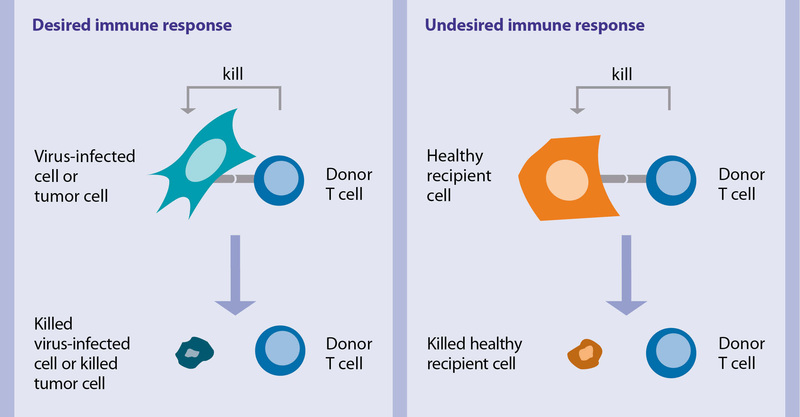 T cells defend the body against virally infected or tumor cells in a normal immune response. When transplanted to a patient, donor T cells may attack the patient's tissue and cause organ damage resulting in a disease called GvHD. 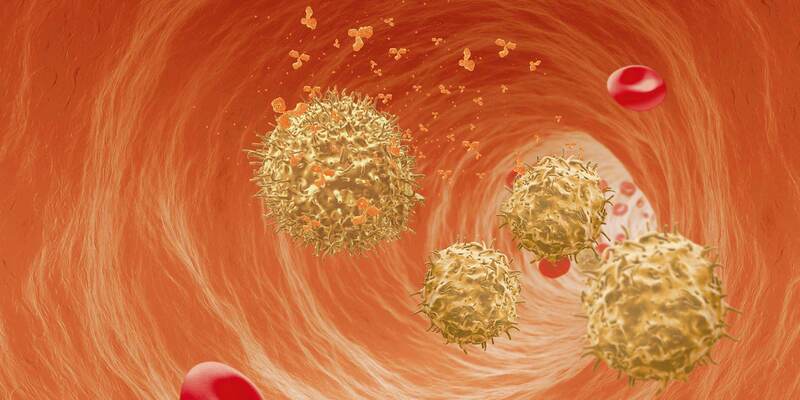 T cells are a subset of white blood cells that play a large role in the immune response. The abbreviation “T” stands for thymus, the organ in which their final stage of development occurs. The course of GVHD varies from mild to severe and can even be a life-threatening disease. 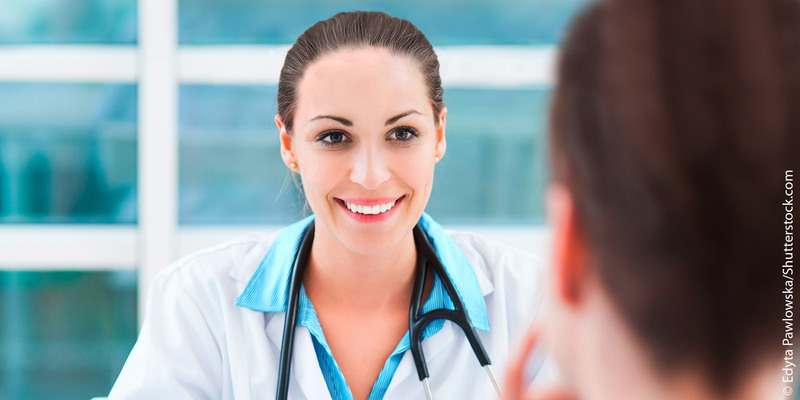 When GVHD becomes a chronic disease, it is frequently accompanied by a dramatic decrease in the patient’s quality of life. Is it possible to prevent GVHD? Different approaches are used to prevent the development of GvHD. Matching of the patient and donor tissue types and immune systems is the first step to avoid an undesired immune response. In addition, GvHD prophylaxis can be accomplished with various methods to reduce the activity of T cells from the donor graft. Immunosuppressive drugs are commonly used to inhibit the activity of the patient’s immune system, including the donor T cells. These drugs are used as prophylaxis for GvHD. Unfortunately, immunosuppressive drugs can have severe side effects. Another viable option for GVHD prophylaxis is the removal of donor T cells prior to transplantation in a process called ex vivo T cell depletion. Removal of the T cells takes place ex vivo, meaning outside the patient’s body. This is accomplished by processing donor cells using an FDA-approved medical device before transplantation to the patient. What is ex vivo T cell depletion? T cells can be removed from the transplant with the use of a medical device. By collecting the donor blood stem cells, the most important players in the transplant, all other cells, including T cells, are depleted. The highly purified stem cells are then given to the patient. Cell types of the human body can be identified by the molecules they bear on their surface. Human blood stem cells are often characterized by a protein marker they bear on their surface called CD34. By coupling a magnetic particle (comprised of iron and dextran, a sugar molecule) to an antibody that is capable of binding very specifically to the CD34 surface marker, stem cells can be separated from other cells when placed in a magnetic field within the medical device. A magnetic particle is coupled to an antibody that can recognize human stem cells expressing the CD34 surface marker. Magnetic enrichment of blood stem cells is performed with the CliniMACS CD34 Reagent System, a medical device to select and enrich CD34-positive cells from donor apheresis products ex vivo, meaning outside of the human body. The enrichment of CD34-positive stem cells with the CliniMACS CD34 Reagent System is an FDA-approved method for GvHD prophylaxis for patients with acute myeloid leukemia (AML) in first complete remission undergoing allogeneic stem cell transplantation from a matched related donor. 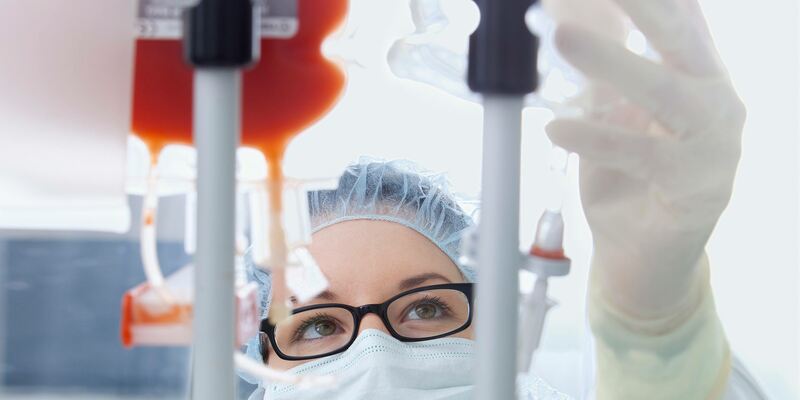 Infusion of highly purified blood stem cells eliminates the need for pharmacologic GVHD prevention therapies in these patients. The depletion of T cells with the CliniMACS CD34 Reagent System results in a low risk of both acute and chronic GVHD for patients with AML in first complete remission undergoing allogeneic SCT from a matched related donor. The low risk of acute and chronic GVHD by ex vivo T cell depletion has been demonstrated in a clinical study conducted by the Bone Marrow Transplantation Clinical Trials Network (BMT CTN 0303). How can I learn more about the clinical data? Ask your doctor about the BMT CTN 0303 study that was conducted to evaluate ex vivo T cell depletion as GVHD prophylaxis and showed low rates of chronic GVHD in patients receiving T cell-depleted transplants.